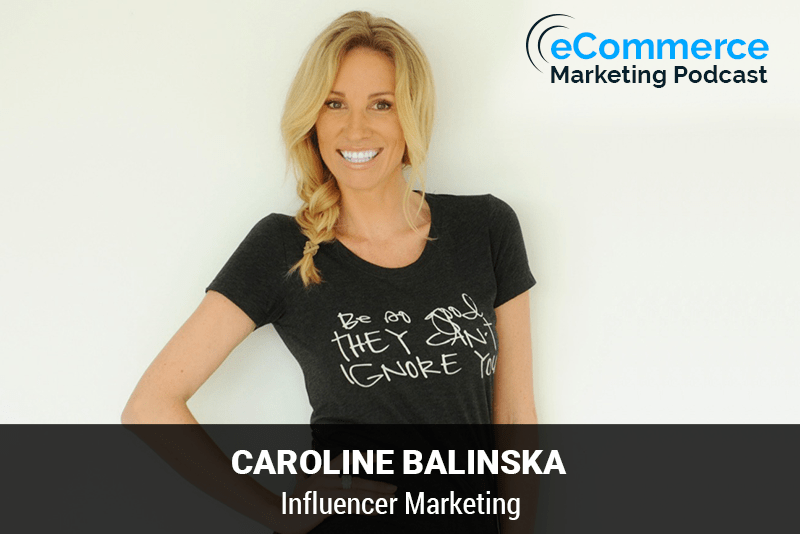 Caroline Balinska is the founder of Just Ask Parker. Shopify's ONLY Small Task Marketing Agency. Caroline has over 18 years of experience in marketing and over 12 years experience in ecommerce. Having started, grown and sold over 12 businesses, what makes Caroline's skills so highly sort after is that she comes from everything from the business owners perspective. Caroline found that the reason startup ecommerce stores where failing was not the right help to get over that hurdle of their first 1000 sales. She created Just Ask Parker to help Shopify store owners get more traffic and sales. Welcome to the podcast Caroline. Thank you so much for having me. So I've still got no voice and I canceled on you last time but hopefully we'll get through today. But thank you so much for having me here. I'm so grateful to have the chance to be here and to talk to you. No problem. You're welcome. Yeah, I understand. It's that time of the year, you know where these calls are going around. I had it earlier in the fall and you know, I know how that goes, but that's just that time of year. But yeah, I'm really excited to talk to you about influencer marketing which is really the topic of today because it is really. Exploding, but before we get into talking about influencer marketing, why don't you tell our listeners a little bit about yourself and your background and specifically how you got into what you're doing today. Sure, so my background salad. My dad's entrepreneur we grew up in a very entrepreneurial house. I started businesses when I was younger and I had my first hairdressing salon at 20. I came in as a business partner and realized that stage. Hang on if I want to make this successful. I need to do some marketing. My business partner was terrible. He'd been there for 12 years and just lived off whatever traffic came past the window on the street and I realize if I want to get this to really happen, I need to get marketing skills behind. So I studied online this is right at the side of online studying and set it online and then went on to sell that business started another few businesses and then I've got very large feet. So I ended up starting my own shoe label of large size ladies shoes. So that was where I had my first e-commerce store back then to get online with a credit to have a credit card system. I had to fill out an Australia a 30 page document. Wow. To let them know and this was my bank that I'd been with forever. Let them know why I was allowed to use the system of having a credit card system on my website and it cost me over 2000 us Australian dollars. So about one and a half thousand US dollars to have that system on my website and pretty much. I don't think I made many sales from it because no one wanted to enter their credit card online back then. You know, I'm talking 12 years ago, right things were different very different building the website. My brother was a website developer. That was just moving pixel over half a millimeter ended up taking us like three hours to do so back then it was a very different time period these website Builders now like Shopify is just. Amazing. I just cannot stress how easy it is for people and I think that that's a thing like I get very passionate because Shopify has made that part so easy for us, but it's the marketing and the business side that people keep on failing at because that's the work at part. Now Shopify has made it so easy that that's no longer work anymore. So now it's the marketing that takes all the work and there's so many people that jump on and they think it's going to be really easy and then they wonder why they're not getting sales. And there's things in that they should be putting into place that they don't even think about so I get passionate about that. That's why I started just ask Parker just to help people that are under 10,000 earning less than 10,000 a month and need help to get started. And like I said to get that first thousand sales because I get really passionate about once you get your first thousand sales. Everything else is easy because too many people say to me. Oh, I want to make a million dollars this year and I'm like, hang on how many sales have you made? Oh, no, come on. Think about that first. Let's just keep. The first thousand not for some people that's a week for some people. It's three months to get there. But don't think too big just get that. I call it the foundation start with the foundation of your business and get that happening and then worry about the rest. Yeah for sure. You definitely have to crawl before you walk for sure. Yeah, you're not going to go from making nothing to million overnight. I mean, you know, there's overnight success stories, but in a way there really isn't because people don't really see the kind of the behind-the-scenes and what it took. For a lot of these businesses to be those big front page stories. So it's like the story on Facebook yet overnight success in 7 years. Yeah, exactly. So essentially there is no such thing as an overnight success. I mean unless you won the lottery or something like that then okay. It's a different story. And that's why I talk about you need time or you need money when you want to get into business if you have the money then go and spend it go and get everyone to do the work but most people don't have endless supplies of money. So you need the time so you're going to have to invest time and you know, sometimes you've got both a little bit of money little bit of time and then you get that balance, but too many people think I have no money and I have no time, but I want a successful business and I'm I was at a time. Where do you think that business is going to start from like magic? It doesn't work like that. That is so. So, you know today like I said, I'm so excited to talk to you about influencer marketing but you know kinda before we get into the kind of nitty-gritty of it. Why don't you just. For all the people that are out there listening that may not be too familiar with it. Tell me exactly what is influencer marketing. Sure. So the last six months have been very passionate about influencer marketing and realizing that it's just such a great place for e-commerce stores to be at at this very time. Of Our Lives because Facebook ads are getting too expensive. So I actually put together a summit but I think that's how you and I connected was I've got the summit that's all about influencer marketing and specifically on that and what I found was that while I was organizing who was going to come on and become guest speakers influencer marketing is much bigger than just Instagram influencers. And I think that's where most of us sat out. Uh, so yeah influencer marketing is Instagram, but there's so much more to it. You can use YouTube you can use Pinterest influences or. Affiliates come under influencer marketing and I think what people don't realize is Affiliates was the original, you know, you've been in this game for long enough Affiliates was the original influences and we call them two different names, but actually they're not all that different from each other because at the end of the day most Affiliates have got a group of people that they get in front of and those people listen and I guess it's we see Affiliates and influences out as our friends. So we take that advice. From that person as if it was a friend telling us so by using those people whether they're influences or Affiliates we can get in front of a cold audience what we would call as an e-commerce or a cold audience but really that audience has been warmed up by a person already who has become friendly has gotten to know those people and that's where it becomes very powerful for an e-commerce store who doesn't want to spend a lot of money on Facebook ads or can't afford them instead of getting in front of someone 14 times. Her Facebook had they can very very quickly with influencers and Affiliates essentially leveraging the audience of these influencers and Affiliates now for those e-commerce businesses that are listening. How do you actually Define an influencer? So let's say I'm running a woman's clothing business and I'm looking for an influencer who would be in a particular Niche would be an actual influence. Yeah, so anyone who's talking to a group of people and telling them giving them advice? Is an influencer so that could be a mum that lives in the suburbs and she's got five thousand people that are on her Facebook or her Instagram or her Pinterest or it could be someone with a couple of million followers or 10 million followers. Anyone who's out there telling other people what they like. And people are responding to that. That's really what it comes down to and micro influencers has become such a big thing now and the best part is what I really took away from doing the summit was that the best audience is a smaller audience with an influence that actually have a better engagement rate. So everyone thinks I want to find that influence of you has 10 million followers because I'm going to get in front of 10 million people and suddenly. Become rich. So yeah, you're actually better off getting in front of a couple of micro influences with five thousand people each eight thousand people each 20 thousand people each and getting in front of them because they have got more engagement With Their audience and those bigger people not saying that the big people are not good, but the engagement rate is better at the lower end. So while you're in front of less people you're getting a better engagement rate. That is so true. And that really goes to the fact that like he said there's different levels of influencers and I was talking to somebody the other day about this, you know, when people hear the term influencer people just I guess we're kind of conditioned to think okay and influencers like a big celebrity like the Kim Kardashian's of the world and you know, the big celebrities that are out there promoting all of these different products and Brands, but that is definitely not the case, you know, like you said, it's really can come down to just anyone. It has a voice and an audience that is able to get people to listen to and they're telling people in their respected. And so I definitely totally agree that the smaller sometimes can be a little bit better because of their engagement and the fact that. Their connection to those followers are little bit more personal typically again. I think the other thing that I took away as well was that there's a lot of influences now who jump on Instagram and they say I want to be famous. And they get out there and act fake and they try to get in front of an audience and they get there's a whole lot of fake stuff going on where people go and get like for like so they'll go to a Facebook group like me and I like you back and we'll get lots of followers and we'll get lots of likes each be look at their engagement is very low and a lot of these people they just want to be famous. That's all they want to be. Whereas the old school way with a bloggers and these are the. Affiliates these are the original Affiliates where they're the bloggers and they were blogging and they just started off just writing because they liked it and then they got into Instagram and Pinterest and YouTube and things like that and they actually have a very very good connection with their audience. They've been doing it for a long time. They're very genuine about how they do it because it takes a lot more effort and they never did it just because they wanted to become famous. They wanted to tell a story or they wanted to engage with people or teach people things like that. I really found was that that sort of person is very very genuine and they have really really good engagement rates and I guess what I always tell people is go and take a look at whoever the influencer is and see. What the actual engagement is like so they might get a lot of like so I never follow the amount of like they might have 10,000 likes but how many people are commenting and are those comments more than just a smiley face. So that's really the important part to me. But the original Affiliates are the ones that West people are still missing out there forgetting about it now like oh, why would I want to work with an affiliate? But the Affiliates are actually the ones that are doing. Really genuine stuff out there. So we might think of them as two different things, but they really not there really they come under the same umbrella the fact that you mentioned that there's a lot of influencers out there. You know, they are truly out there to empower others, you know, they have a certain amount of knowledge and they want to really spread it. They're not out there to become a celebrity to become a first, you know a front page name. I was thinking about some influences in the marketing space that I believe fit that particular. Picture and one of them is Neil Patel and actually Eric sue for those that aren't familiar. They are some marketing experts in the marketing industry digital online marketing industry. I think they definitely fit that bill. They've got a couple things going on with their blogs as well as their marketing agencies and I follow pretty much everything that they do and I've learned a lot from them and I've never gotten the feel that they were about. You know any type of self-promotion they truly out there to try to empower others and I think that shines through. Yeah, that was actually the famous story. I'm sure that you've heard of it there Tim Ferriss effect. You know that story about missing in Maine. Why don't you Enlighten us a little bit about that for yesterday that one I actually tried to get him onto the summit but he just the timing didn't work for him. So I want to try to get him in as a bonus at some stage. So the Tim Ferriss effect. There's a blog post on medium.com about if you Google it and it's about this guy who's got a brand of show. Men's business shirts and Kris free he'd been advertising in a whole lot of like the New York Times and GQ magazine and then he spent all this money on Advertising. Nothing was working that well and someone told him to go on the team first podcast and he was like, oh that's a lot of money to do that and he ended up making. Ridiculous amount of money and he said that was really what took him off and he was explaining how because he's an influence on we think of him as just you know, he's a podcaster or you know, he wrote a book he is an influencer. So if he got on his podcast and said, I love these shirts. Everyone's going okay. Well if Tim Ferriss likes it, then it must be good. So it's about the adverse effect that and is about him but it also is just about influences and actually it's in general and I think that it's very powerful what influencer marketing can do and I was also going to say one of the summit guess I had he's actually another podcaster and he's got three different Bigcommerce stores all very very different to of his stores. He works with influences on YouTube and one of them he actually does a lot of. It influencer marketing where he just makes purely with Affiliates. So I think that people need to be open and I thought that was a really good interview because he explained the difference between them. So everyone thinks straight away I owe a lot of people say to me, why would I want to work with an Instagram influencers? And it's like you don't have to think of it as that think about, you know, there's a lot more out there than just influences on Instagram. I think that finding the right influence of for your brand will Skyrocket sales and there's someone out there for everyone so you'll is. The right influencer or. Someone to help you promote your business no matter what you're selling for sure. And I like the mention of that the Tim Ferriss effect. I kind of thought about early to mid-2000s when the Oprah Winfrey show was huge. There was a thing called the Oprah effect where you know any business that was featured on her show or was a part of her favorite things. They would become I guess essentially just over huge success is overnight. I think it still happens to an extent through her magazine. But yeah, it's similar to the Tim Ferriss effect for all. Business is listening that can't get a hold of the Oprah's and the Tim Ferriss is of the world's. How do they find influencers? What's a method but that's actually not that's actually not true. So when you just said about Oprah Magazine, there was someone recently I saw she's just being in the O magazine and she actually had that happen to her just recently. I can't remember who it is doesn't really matter. It's still happening though. Like you're you're saying. Yeah, but when I started my shoe label, I had that issue where I went. I'm a nobody. I've got a she label. How am I going to get out there? Just put shoes into boxes and send them out to every magazine in Australia and I sent them the full pair of shoes. It cost me a lot of money and a lot of time had writing all the letters but I sent things out rather than just going into email and going hi. Do you want to sell my shoes? You want to promote my shoes? I sent them a pair so they could hold them. They were handmade leather shoes. They were really beautiful shoes and I had to magazines pick up my shoes within a couple of weeks and I'm saying it because a lot of people say to me. Oh, I can't make that happen. Well, no. Not true anyone can make it happen. You've just got to know where to go. So I think that that's not a problem. There's really great apps out there like brand snob is one that I interviewed on my Summit. I've had some other ones as well. Glenn Bassett is another one and these two apps in particular. I had them on my stomach because I went wow your app is amazing you jump on there as an e-commerce store and you say I want an influencer that can promote. My product and your details now one thing that I always tell my clients is make sure you put your campaign up as if you're selling yourself because if you just put up, oh, I've got a product. Do you want to promote it? You're not self and I had a client I had to go in and change his whole campaign. He said no one's applying for anything. No because you still have to sell yourself. So get in there and go. I've got the best product. It's great because of these These are the benefits and if you've got an audience XYZ, then they're going to love this product for this reason put up your. Tom Branson aalborg Ambassador Ambassador is got a program where it's like ten dollars to set up. It's crazy to say that you can't do it. Like anyone can do this jump on their set it up and then all you have to do when people apply you go through and you say okay, which one's good enough. I've got one of my new clients. She something up and she had a hundred forty people apply within 24 hours. Wow. Went through the list and she chose the ones that you like the best and then she sends in the product. Okay, which product want to promote and then that's it. That's done. Then that person promotes it now. There's a few extra Little Steps along the way and in some way I talk about, you know how to work that through but that's pretty much the gist of it. Yeah, that's amazing. And that's really the goes to justify the power of the internet these days and with all of these services that has been able to connect people like you said businesses with potential influences where prior to. I mean, it could be done trying to find people like that to be influencers and promote your brand, but it was more of the kind of. Old school just direct Outreach and you know you can still do that. There's nothing wrong with doing that today because sometimes it's still going to take that just your continual follow-ups sending your products out. But those sites like you mentioned the Glam bastarz of the world definitely make it a lot easier to facilitate that whole process for sure. Yeah, definitely and look Mike the one that interviewed the store owner. He in his case only goes after YouTube influencers for one of his businesses and he still does. Outreach person like he does not use any app for it and he reaches our personally he's got a team of people they do it. It might be a slow process but he ends up that's better and he's got a very Niche product. So it makes it like he doesn't want to do he's not selling coffee cups. Yeah, he's selling something much more Niche but at the end of the day what? Store owners forget is how they're not willing to put in the effort and that's why they're failing. You've got a penny of it's about choosing one or two things that are going to work for your store finding. Don't try to do everything find a couple of things and just really get in there and do it and influencer marketing is good for your business get in there and do it and I can tell you there's not many stores that can't do well on influencer marketing jump in there and give it a good go and make it, you know, try try try try don't give. After one time, right right for sure. Yeah. There's I mean these days there's you know, the possibilities are truly endless and you know, once these influencers that being able to isolate some influencers, how do they actually successfully track these influences activities? Because the bottom line is most. People usually do kind of a paper performance type thing. So they're going to pay these influencers based on the performance. You know, how many sales do they send What's the total volume? And what are some of the best ways to track and manage this? Sure. So what I always recommend is that a lot of these micro influences on platforms like brand snob and go Ambassador. A lot of them don't want any payment. They just happy to get the products for free and promote it some of them want payment some of them don't so it's not a matter of what's right or wrong. It's just how it works. But even if they don't want payment I still recommend that they use something like on this star to make sure that they're tracking that's particular influencer. And the reason for that is that. If that influenza gets one of your products and let's say it's cost you $50 and then they come back to you a few months later and they say to you. Hey, I want to do another promotion for you. You want to be able to say this worked out? This didn't work? Why would you go back down that path? So even if they don't want to get paid I always recommend using an affiliate software to track that link. There are cheaper ways to do it. You can go and use a bitly link but there's a lot of problems behind that as I you know, I'm sure that you've told your listeners about things like that but something that I'm new star is definitely a great way for people to go. Okay. This is my link and I can get tracked now how much percentage commission you give them what I always recommend it's based on. How much would it have cost you to get that lead on your own right? If you want to be paying for Facebook ads and a lot of people come to me and they go. Oh, I spent all his money on Facebook ads and nothing worked. I put 500 dollars in and I got no sales. Okay. So you put five hundred dollars in you've got zero sales from that and now you're going to get an influencer to work for you for free. You just sending them a product and you're telling them that if they get a sale for you, you're only going to give them one for a cent. Hello, right? She weigh more than that. If you are running Facebook ad so give them a good amount of money the more money you're willing to give the affiliate or the influencer the more likely they're going to go back and do that promotion again, but if they do a promotion and they go oh, I got 20 sales so that person I'll but they only gave me five percent on each sale. So I only ends up making $50 they're not going to want to work with you again. So think about what that's actually what the value is to you because it's about working in collaboration, and it's not about. You trying to get something for free out of it influence that they do work. They take photos. They have to make themselves look good. They have to get a good presentation of their the place that they work in some of them get photos edited some of them work with actual photographers. There's a lot of work that goes into being an influencer so. If you think that it's that easy God do it yourself if you think Bingley boys are so easy go into a why don't you do it right involved. So hey them as a collaboration. Don't pay them as oh, you know, they got a free products that they should just be lucky by that know you want to work with people long-term. So do the right thing. Set up an improper affiliate link and then say to them, you know, go and check it yourself. Don't try to hide. That's the other thing like a bitly link still hides the sale and affiliate link will actually show that they can log in and say oh there was ten sales. Otherwise, it looks like you're sort of trying to hide things. Like I don't want them to know how many cells are actually got me. I'm going to tell them what was five but really it was 20, so. I think the influences especially the old school Affiliates. They won't take on someone who acts like that. They would take on some of the get some a bitly link. They'll be like no no, no if I can't track my sales and see it. I don't want to work with you. Yeah that that is so true. And thanks a lot for that promotion and a plug of our Omni star affiliate software. That's definitely one way that you can track influencers and you're so right about rewarding them and you one thing you do have to think about as well is that. Typically these influencers. They're going to carry a little bit more weight than just, you know, the average affiliate or average person that you have promoting your product or Services because they have a they have an audience. You know, that's that's the bottom line, you know, maybe it's several thousand two, you know and up to hundreds of thousands. That's a built-in audience that you're getting direct access to so that's going to come with a cost. You know, you've got to understand that to get access to that you want to they're going to expect a certain amount of commission or a certain kind. Sensation and so otherwise, they're just going to kind of bounce off and go into the next company and I think that the most important thing about that is remember that you're not paying if they didn't get you sales, right? Of course, they sometimes you have to pay a fee up front. I understand that that's that's a different method. But the thing is imagine if you give away a product for twenty fifty dollars something like that and then they promote it if they do not get any sales for you. That's all you owe them. But if you do a Facebook ad or a pinterest's ad or a Twitter ad whatever I'm. I want to spike try to say that Facebook is bad Google and it doesn't matter you run an ad you run those ads you're paying for those ads whether or not you would say or not. They look Google's not turning around going. Okay, mate, you didn't get any sales will not charge you today isn't what you need to say. Okay, you're going to get 20% per sale because you know, what, if you can get me that customer and they actually purchase on my website it was work right for sure and you know, it's just those are sales at the business wouldn't have received otherwise, so that that's what that that's definitely what they have to think about. Now. As far as promoting is concerned with regards to these of influencers Which social networks do influencers typically have the most success on as far as promoting a company's product or service or you know, does it. It really varies like working with for the summit. I actually interviewed I think five or six different influences very different influences. One woman was in her 50s one guy who was 20 a couple of girls that were in their 20s and 30s. There was a very big mix and I can tell you right now that there is no right way of being an influencer. Some of these influences were doing really well on YouTube and some of them weren't so and they were doing the same sort of products it really has. Do that. The more genuine they are the more they are going to be on the platforms that suits them. So your job as a merchant is not about finding the influence of that you like it's about finding the influencer that has the audience that you want to Target. So. For instance, you know, there's a couple of influences out there that are really really lovely and that since working since I interviewed them. I've been like telling my clients going work with these influences reach out to them because in my Summit I allow people to contact the influences directly and these influences are more than happy to work with anyone that contacts them through my Summit and it really comes down to will that influence of be able to get the product in front of the right person now if that's on YouTube or if that's on Pinterest or on that if that's on. That comes down to them having the Right audience. So it doesn't really matter. Which audience it's Natasha is a good example. She's in her 50s and someone like her you would say. Well not many 50 year old women six year old women are on Instagram, but the ones that are following her. So even though there's less women in that age range on Instagram. They're more likely so some people say well then I should be on Facebook because that's where the 50-year old lady is on his Facebook or Pinterest. That's true. But Natasha's got a great personality. She's very engaging so she's collecting those women in that age group very very quickly. So to say oh, well, I don't expect my audience to be on Instagram. Is there a way of looking at it? So she's got the right. For particular products go after her and the same goes with another platform. You know a 20 year old guy. Where should he be YouTube is what you would think? Oh, yeah 20 year old guys on YouTube gaming. Well, one of the guys they interviewed. He's a 20 year old kid. And when he first came forward to me, I thought oh God, is he going to be any good and I thought I'll just scrap the interview if he's not what this kid is amazing like he is so if you look at his Instagram feed his photos are so spot-on and he goes into so much detail. He makes so many sales for his customers. And he's a real boy on Instagram. So. As long as your audience is with that particular influence that that's all that matters. It really is all going to come down to the engagement that these influencers have is it it is it genuine engagement that they have or they just you know, are they just kind of have a following and they're just trying to rack up the numbers as far as the amount of followers, but they're not really concerned about having a genuine engagement. I think you can quickly and easily tell that by just looking at their social media activity there the recent polls to where they are. Conversations are having you know, it takes a little bit of due diligence. But by doing that with that work upfront you'll be able to definitely find an influencer. That would be right for your business. Well Caroline everything that you've brought to us today has been has been awesome. I hadn't talked a whole lot about influencer marketing before in the podcast. So I think. You've brought a wealth of knowledge and wisdom, and I know our listeners will appreciate it for sure. We're definitely glad to have you on here. But the way I like to close things out these days is to kind of switch gears here and kind of ask you one thing that our audience would be surprised to know about you. I got to go with my partner two years ago. And for the first birthday, I decided one of the kids for children and I decided to make her a cake for her birthday and she pointed out that she wanted the unicorn cake that was very famous on Instagram two years ago and I went sure honey. I'll make that I used to make cakes when I was 10 years old, so I haven't done it for a very long time it May 6 hours to make it well and then I had to make it a gain of about a month later for something else because my partner's like I need to take. What thing the cake competition at my work? So can you make that cake so it took me another six hours and instead every Des for children. I'm like what a stupid thing. I did. So every single year I have to make for cakes and next week in a couple of days. I'm making a giant fake popcorn bucket with popcorn on top. There's going to be a cake for the 16 year olds birthday. So it's not just the hours of going to the cake but it's the hours are going to deciding which cake I'm going to make. Because as to outdo the last one so it makes it been pretty crazy. I've now this will be the eighth one that I've done. So yeah, it's a lot of our spending to make one cake and I'm not an expert in any sort of way at all. So it's too funny process. Yeah. That's that's interesting. Yeah. It's um, I'm a sweet tooth and so my my yeah my wife watering thinking about that popcorn cake for sure, but I use the best cake like I make the cake mix myself. It's not for a packet. Everything's different rate. It is the best cake that. Did the first time from a recipe and the kids love it and now I always use that same one sponge cake and off. It's a dye for so yeah, it's a fantastic tasting cake. Okay, that's awesome vi vi our cake. Well, it sounds like you may have another little side business there. If you ever get tired of the marketing Services, I think you may have a profitable. Obey I found out that the unicorn cake costs here in Amsterdam $300 300 euro to buy one of those cakes. So I think even. After my six hours, I haven't really made any money by the time I paid for all the ingredients and the gold and the blah blah blah. So no, I think I'll stick to marketing. Well, at least it's a good fun activity and it's a hobby for you. I guess you could say yeah, definitely. Alright awesome Caroline. Well, thank you for sharing that. I appreciate that and you know, finally if any of our listeners want to get in touch with you. How did they do? Sure, so they can head over to if they want to know more about influencer marketing. The best place is winning with Shopify.com. And I've got the summit that's three days for free learn more about influencer marketing and I can guarantee you get in there and try it. There's nothing better than it at the moment. It's getting great results for people and that's what I recommend for everyone. Okay? Awesome. Thank you will definitely our listeners will definitely take advantage of that. And once again, thank you for being on the e-commerce marketing podcast. Thanks, Alan and thank you everyone. It's been fantastic. Thanks. Thank you for listening to the e-commerce marketing podcast. You need to get more feedback and reviews from your customers and improve your customer retention. We have made it easy to do all of this with our Advanced customer feedback software just visit get OS i.com forward slash feedback and sign up for a free trial today.